Kapost knows better than anyone that non-data-driven companies are being left behind. They’ve staked their entire company on it. And the business world agrees, with high-profile companies such as AT&T, IBM, and LinkedIn signing up for their unique data-driven content marketing system. But when it came to building out their internal analytics, Kapost ran into obstacles familiar to any company trying to cross this digital divide. 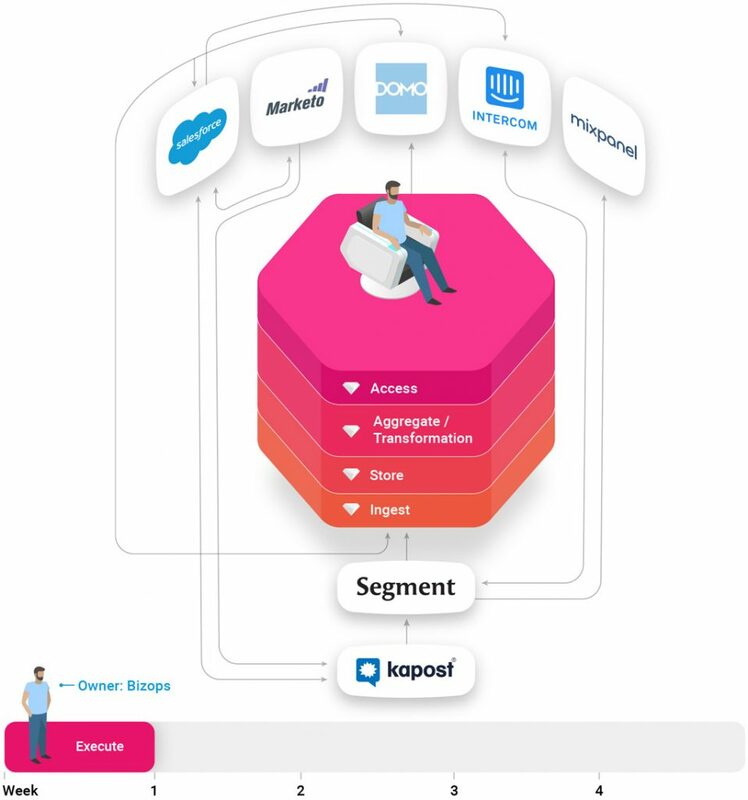 Like most companies, Kapost uses a variety of SaaS tools to coordinate and automate its activities. Mixpanel to track product usage, Salesforce for CRM, Marketo for marketing automation… the list goes on and on. The problem is, none of these tools provides easy access to the raw data underneath. When someone wants to build a new performance metric by merging events from Mixpanel, Salesforce, and Intercom, they need a small army of software engineers just to get the data out of these various tools. Frustrated by the drag these ad-hoc requests were placing on his development team, Kapost’s CTO built a custom Rails app to aggregate data from various APIs into a common database. It seemed like a perfect solution at the time. 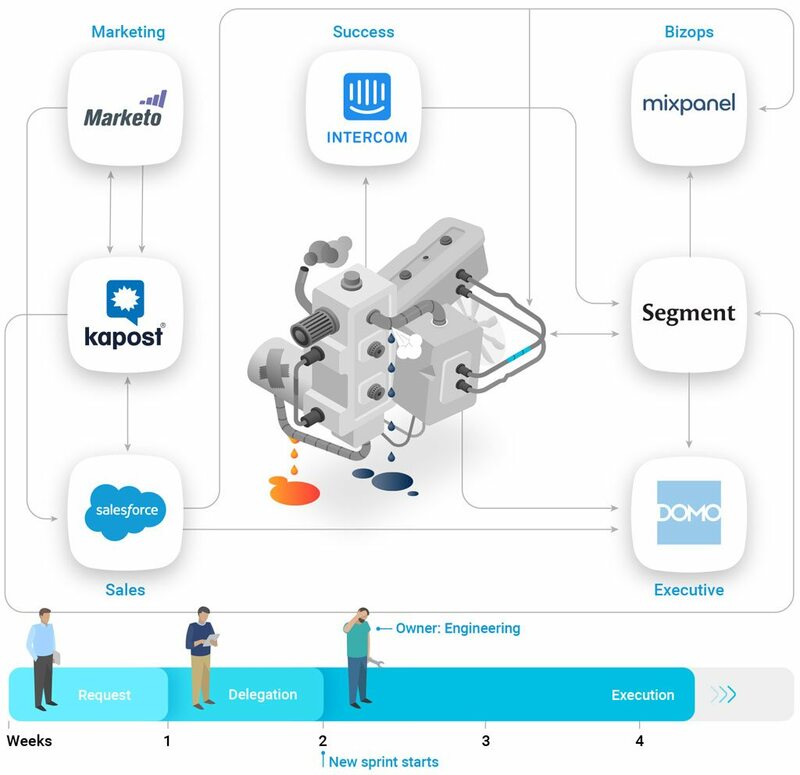 But as Kapost’s operations grew, new connectors and aggregation processes kept being added to it. The app became a bloated, constantly-breaking Frankenstein, stuck together with patches and glue-code that nobody fully understood. Far from empowering Kapost to use data effectively, their home-grown solution kept the Business Operations team waiting weeks for engineers to fix problems or add new aggregations. In a fast-moving startup, they were falling behind. Kapost knew they needed a better solution. The gap between the company’s appetite for analytics and engineering’s bandwidth kept growing. Everyone on the executive team had hypotheses that needed testing. Marketing was desperate for a more complete view of their funnel. Front-line employees, motivated by a new success-metrics-based bonus program, clamored for dashboards to track their progress. To keep up with this demand, Business Operations needed complete control over their data systems. While most of the tools they looked at only fixed part of the problem—and they looked at everything—Treasure Data was different. It allowed them to centralize their data across multiple databases and SaaS tools, with no engineering required. They migrated all their analytics logic onto Treasure Data’s Compute Cloud and retired their hard-to-maintain Rails app. The Business Operations team finally owned the entire system, empowered to create new queries and aggregates using Treasure Data’s intuitive interface. In just 30 days, Kapost was able to centralize and provide easy access to all of the company’s data for the first time. Treasure Data allowed Dev Ops to own the process of ingesting sensitive product data, while giving Biz Ops complete control over the business logic driving KPIs. The flexibility to set up new connections on the fly allowed them to experiment with several visualization tools until they found the right fit—something they could never do if they needed engineering support for each new connector. Not only has Treasure Data helped them survive their passage across the digital divide—it has become an important partner with Kapost, as they blaze new trails through the data-driven economy.